MIAMI, Fla. — Not everyone participating in this year’s Super Bowl is a football player. 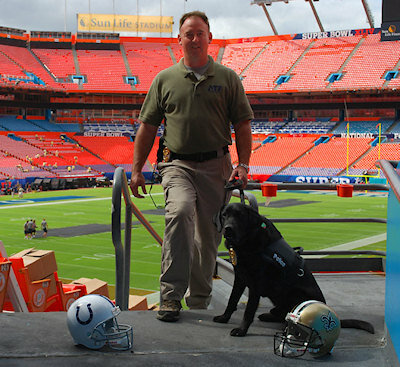 The Bureau of Alcohol, Tobacco Firearms and Explosives (ATF) have fielded their best players to help prepare for a safe and secure Super Bowl XLIV. 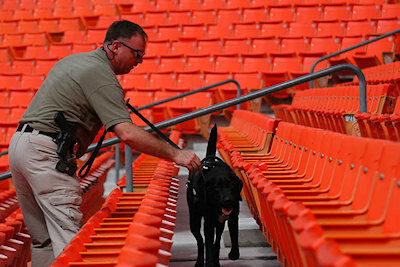 These pros include ATF K-9 explosives detection teams that have been deployed to Miami from around the country. The K-9 teams are working side-by-side with other federal, state and local law-enforcement officers to keep the football teams and fans safe throughout this event. "The K-9 teams that are here in Miami for the Super Bowl are the best of the best," said Hugo Barrera, Special Agent in Charge of the ATF Miami Field Division. "Like the football teams that will be playing in the Super Bowl, these handlers and their K-9 partners have been training and preparing all year for this event," Barrera further stated. "We are proud to say that the only thing the fans have to worry about is whether their team wins or loses." One of the K-9 teams working in Miami is Hoover Police Officer / Canine Handler Lee Love and his black Labrador retriever, “Hans.” Officer Love and ATF K-9 Hans have been partners for three years and are detailed to Miami from the Hoover Police Department, Hoover Ala. They routinely work together in criminal investigations and at high profile security events where their expertise is needed detecting the presence of explosives, firearms and ammunition. They were called to assist at this year’s Super Bowl to help locate any type of explosive, which may be in close proximity to the Sun Life Stadium or any other venues relating to the big game. ATF has used its explosives detecting canines at other special events including the Republican and Democratic National Conventions, the Presidential Inauguration, the G-8, the World Series, NASCAR, the 2002 Salt Lake City Olympics and of course, the Super Bowls. ATF’s program, which began in 1986, uses only Labrador retrievers. The dogs are supplied by the Guiding Eyes for the Blind, the Guide Dog Foundation, and Canine Companions for Independence. These specialty canines attend a 10-week training program with their handlers that are conducted at the ATF Canine Training Center in Front Royal, Va. Upon completion of this course, the canines are trained to detect a variety of explosive compounds and materials that could be used in an explosive device. The canines can also detect firearms and ammunition and are used in the more traditional protective search and sweep operations. Once the canine and the handler complete the ATF basic training course, they begin their field work and continue to train on a daily basis.